Bill Shires is an Associate Engineer with Fall Creek Engineering. Bill has worked in the field of civil and environmental engineering with a focus in civil site design and water resource engineering. Bill is a designer and drafter for Civil and Environmental Engineering projects in the office. Bill has entered FCE with a broad range of design experience with a multitude of Northern California Area residential developments. His projects have included cost estimates, plan preparation, stormwater management plans, and a vast experience in utility district and local agency plan submittals. During his time at FCE, he has assembled construction documents plan sets, drainage reports, and nitrogen loading management plans for agricultural applications. Bill’s expertise includes water supply and sanitary sewer network design, rough and fine grading design, and familiarity with C.3 stormwater technical guidance. Bill utilizes advanced computer applications including AutoCAD, Civil3D, ArcMap, and other software to complete his stormwater management, water resources, and civil site design projects. 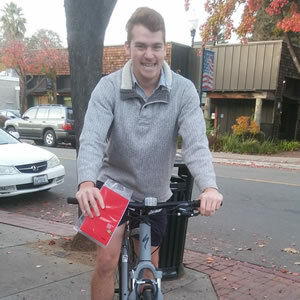 Bill’s passions outside out of work includes his civic involvement, most notably to help his hometown of San Luis Obispo achieve Gold status as a Bicycle Friendly Community, designated by the League of American Bicyclists. Bill holds a B.S. degree in Environmental Engineering with a minor in City & Regional Planning from California Polytechnic State University, San Luis Obispo.